When you walk across the Commencement stage and accept a diploma, it’s a thrilling moment. Back on May 13, 1990, Carol and I were exhilarated to have such a moment along with our classmates. Each one of us shook the hand of President Thomas Manion, then moved our tassels from right to left and entered into our new responsibilities as proud alumni of St. Norbert College. And each of us looked optimistically at our next chapter of life, if a bit unsure of how it would be written. At the time, I had no way of fully appreciating the enduring, lifelong value of my St. Norbert education and all it had given me. Luckily, this May 13 – exactly 28 years later – I would have the chance to revisit that stage and experience Commencement from an entirely new perspective. This time, for sure, I was fully appreciative of the profound value St. Norbert College gives its graduates and the communities in which they will live, work and serve. As I looked out from the podium, the thrilling sense of joy and optimism we all could see and feel among the 470 graduates and their families was unmistakable. Four hundred and seventy Green Knights, each one adding their gifts to the good work our 22,000-plus alums have done to make the world a more radically hospitable place. Let that soak in for a moment. One of the assignments I gave myself this past year was to talk to as many members of the SNC family as my schedule would allow. I’m naturally curious and, truth be told, I love a fact-finding mission almost as much as I love finding a great fishing spot. So Carol and I traveled coast-to-coast, from classroom to conference, meeting with alumni and friends. We listened. Learned. Laughed. And the most common question posed to us was about the value of attending SNC today: What makes St. Norbert a special place among the hundreds of liberal arts colleges and public universities out there? provides students with broad knowledge of the world they live in, a deeper understanding of themselves, and an appreciation for lifelong learning. combines in-depth study with essential, highly transferable skills like communication, critical thinking, decision-making and problem-solving. offers students lived experiences, each one preparing them for the complexity, diversity and rapid pace of change they will encounter in their vocations. leads students toward becoming citizens who hold themselves accountable for seeking truth, acting for justice, and working for the betterment of society. It’s no surprise that our graduates are in high demand in today’s job market. In fact, a recent survey of SNC grads found that 96 percent of respondents are either employed or attending graduate school within nine months of their graduation. A recent study by the Association of American Colleges & Universities found that employers are setting a premium on broad-based intellectual and interpersonal skills, and innovative thinking. Ninety-five percent of employers say that a candidate’s demonstrated capacity to think critically, communicate clearly and solve major problems is more important than their undergraduate major. Essentially, a broad-based liberal arts education provides exceptional value in today’s job market, one which puts a premium on those who thrive in cognitive, nonroutine work. Further, the workforce dynamic in the United States continues to change rapidly. Consider this fact: One-third of those in the national labor force will change jobs every year. By the time our 470 grads are 40 years old, most of them will have changed jobs six or more times. Let that soak in: an average of six or more career changes in the 15 years since they moved tassel from right to left. Yes, we are preparing our students for a world that is profoundly different from when Carol and I shook Dr. Manion’s hand on that stage in Schuldes on a warm May afternoon in 1990. And, yes, the college will continue to evolve. But our focus at SNC is a venerable and valuable asset because we will never waiver from the uniquely engaging, highly relational, Norbertine-centered learning experience we have pledged to offer. It’s an education preparing our students for the dynamic lives of good work that they and the world need and deserve. The enduring mission of St. Norbert College, with its beautiful intersection of the Catholic, Norbertine and liberal arts traditions, allows us to approach learning as a relational endeavor. 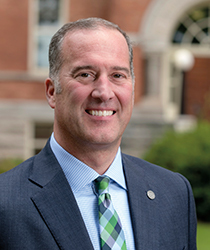 To President Brian Bruess ’90, it's a philosophy that not only elevates the learning experience at SNC but makes for meaningful outcomes, too. Our study of the macro market and workforce trends underscores the real-world value of our focus on creating an engaging student experience – one that fosters personal, intellectual and spiritual growth for every student.